Ceiling Fans are arguably the most ignored appliance when it comes to energy savings. People talk about big appliances like AC and refrigerator consuming a lot of energy. But what most people do not understand is that Ceiling Fans cumulatively consume more electricity than a refrigerator in a house. In fact, after Air Conditioners (if used), it is the second biggest contributor to electricity bills of any household. However, ceiling fans have a very good scope for reducing power consumed using a technology called Brushless DC Motor or simply BLDC motor. In this article, we will explain what BLDC fans are, their efficiency, their benefits and how they are on a cusp of bringing a paradigm shift in the ceiling fan industry. BLDC technology, in general, has been in the market for a couple of decades and it is widely implemented in industries needing high torque motors. What was missing so long is its application in the ceiling fans. That start was done by startups like Versa Drives who offer Superfan and Atomberg which offers Gorilla fans. 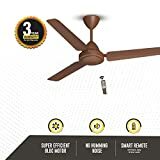 They are the pioneers of using BLDC motor in the ceiling fans in India. The traditional fan uses an induction motor and typically consumes 70-90 watts. But BLDC fan, on the other hand, can reduce power consumption up to 65%. The latest line up of Gorilla fans consumes just 28 watts of energy. Over the past few years due to the hot debate of climate change and need for energy efficient systems, BLDC fans have come into the spotlight. In fact, 3,000 traditional fans in IIT Bombay are now replaced with BLDC fans. 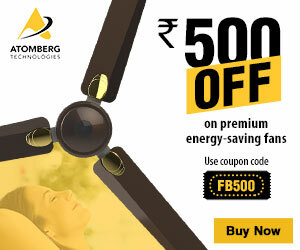 Just a few months back in March, Tata Power Delhi Distribution partnered with Atomberg to launch Gorilla fans at a discounted price. Similarly, in Mumbai, Reliance Energy is offering heavy discounts on 5-star rated BLDC fans under “Change for Mumbai” initiative. We at Bijli Bachao have always disseminated information about the energy efficiency of BLDC fans and supported its cause right since its inception. Not only they are energy efficient but are equally capable—delivering the same air flow rate as found in normal fans. Let us now analyze the BLDC market and understand how each of the brands fare in their offering. Atomberg Technologies and Versa Drives are the two pioneers of BLDC fans. Versa Drives were the first introduced the BLDC fans while the Atomberg made them popular. Lets us now take a deeper look into this each of these companies. Atomberg Technologies was started by graduates from IIT Bombay in 2012. This modern hardware company was started with a vision to create smart and energy efficient appliances. Gorilla ceiling fans is the most popular offering from Atomberg. Having sold 2 lakh fans so far and with a production capacity of 25000 units/month, Atomberg is certainly the leader in B2C (Business to Consumer) segment. Seeing a very good reception by customers, Atomberg has plans to expand its business by coming up with additional energy efficient products like pedestal fans and wall mounted fans. Over the last 2 years, Atomberg has won awards from WWF and United Nations for their innovation and their founders have garnered accolades from Forbes and Government of India. However, there is one area where Atomberg still needs to improve, and that is on premium looks. But they tried to address that shortcoming by launching new category of premium fans. What remains to be seen is whether the market accepts the premium range of fans as they are priced slightly higher than the base range. Versa Drives is another IIT’ian startup. In fact, they were the first to introduce BLDC fans in the Indian market. The Superfan – A1 is their most popular offering. Their fans are also highly energy efficient with good air delivery. They also have their products available in cool colors, which make them an attractive option. The products also come with 5-year warranty. They launched their fan in December 2012 and did market aggressively both for B2B and B2C in the beginning. Over time however their B2B model worked out great and the B2C got strong in South India. They have a strong distribution network in South India, but their network in North and Mid of India remains weak. Their presence on e-commerce platforms has also reduced over time as most of the online sales was taken over by Atomberg’s Gorilla fan. A ceiling fan is a typical appliance popular mostly in the Indian subcontinent. So, there is barely any foreign player offering ceiling fan. The Indian market for years has been dominated by likes of Bajaj, Crompton Greaves, Orient, Havells etc. Over the years they had the expertise and experience in making induction motor-based fans but had a laggardly attitude towards innovation. But thanks to the efforts of startups in popularizing BLDC fans, they are now forced to innovate and come up with BLDC fans. Usha offers Energia models which uses BLDC motor and consumes 32 watts at peak speed. Orient has launched Ecotech series which comes with BLDC motor. Its power consumption is of 32 watts. Problem with Ecotech series is the remote working range is less. Crompton used to offer BLDC fans under the Esave series but they have discontinued this product. Bajaj doesn’t offer any BLDC fan till the time of writing this article. 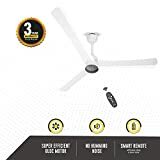 In short, it has been observed that BLDC fan offering from the established ceiling fan brands is restricted to only a few models, their availability is erratic, and their reviews are not so great on online platforms. Besides the pioneers, Versa Drives and Atomberg and the established ceiling fans brand there are few other new names which offers BLDC fans. But most of them sell their fans directly to businesses and government offices via tenders. Only a handful of them like Jupiter offers BLDC fans to the consumer through retailer network or online. Rest others don’t directly deal with the retail customers. Now let us mathematically calculate how much electricity would be consumed, how much money would be saved using BLDC technology and how long it would take to recover the price of a BLDC fan through the energy saving it gives over time. Typical price per unit of electricity in India is assumed to be around 6 Rs for the residential users. Though the pricing per unit varies greatly between regions, power companies, slab it is in, and whether the usage is commercial or residential. For metros, it is better to assume tariffs around 10 Rs/unit but for India as a whole 6 Rs is more practical. With BLDC fans you can save approximately 1500 rupees per year. 1500 rupees is usually the price differential when buying a BLDC fan i.e BLDC fans starts with the pricing of around 3,000 Rs while ordinary fans are roughly prices around 1,500 Rs. So, in short, if you run your fans for more than 15 hours daily and per unit electricity cost exceeds 6 Rs you can expect to recover the complete cost of the fan in less than 2 years in the form of energy savings which BLDC fans give. With the above calculation, you would have already realized the cost-benefit of having a BLDC fan. Energy saving is the key forte of BLDC fans. BLDC fans would be way forward in future. Hope through this article you would make a better fan buying decision. And if you are now sure to buy BLDC fan then let me say: CONGRATULATIONS!